Timothy Taylor Gallery is delighted to present an exhibition of works by Agnes Martin (1912-2004), one of America's foremost abstract painters. The exhibition will feature significant paintings and works on paper, and will trace a singular career that spanned over five decades. This will be London's most significant retrospective of Martin's work in over 15 years. Although frequently labelled as a Minimalist and closely affiliated with artists such as Donald Judd and Carl Andre, Martin always described herself as an Abstract Expressionist. As a young artist in New York during the 1950s, the influences of Mark Rothko and Barnett Newman proved particularly important to Martin. She similarly rejected recognisable forms, and strived to represent infinite space in a quest for the sublime. Also proving vital to Martin's practice were the concepts of Taoism and Zen Buddhism, which she had studied while at Columbia University in the early 1940s. Her concern for conveying emotional content rather than ideas, and belief in the truth of unfettered inspiration over intellectualism set Martin apart from her contemporaries. The qualities of beauty and perfection evident in Martin's paintings bear testimony to the artist's spiritualism and disciplined approach to life. Famously claiming that she âpainted with her back to world', Martin refused to acknowledge the impact of any given environment upon her work. Nonetheless, the landscape of New Mexico is effectively conjured in the shimmering horizontal bands of ochres, pinks and myriad blues Martin began using following her move South in the 1970s. Martin considered music to be the purest form of abstract art and in paintings such as Untitled No.12, 1997, the carefully repeated arrangements of various bands are themselves suggestive of musical phrasing and evoke a contemplative mood. Coupled with the ruled graphite lines that demarcate the different translucent washes of acrylic paint, Martin's compositions frequently recall the staff lines of sheet music itself. In 1993 Martin moved to Taos and began working in a small studio near her home. It was at this point that she reduced the dimensions of her major paintings from 6ft squared to 5ft squared. This adjustment to a more human scale gave rise to many of Martin most emotionally intense and beautiful paintings. Untitled, 2001, one of Martin's rare small paintings, consists of narrow bands of navy blue alternating with thicker bands of a paler sky-blue wash. Characteristic of her late period, the brushwork here is more free than ever before, and communicates what was for the artist a time of optimism, peace, and contentment. Agnes Martin was born in Maklin, Saskatchewan, Canada in 1912. She studied at Western Washington College of Education, Bellingham, WA, prior to receiving her B.S. in 1942 from Teachers College, Columbia University. Following graduation, Martin attended the University of New Mexico, Albuquerque, where she also taught art courses, before returning to Columbia University to earn her M.A. in 1952. Since her first solo exhibition in 1958, Martin has been the subject of over 80 exhibitions, including in recent years Agnes Martin: The Nineties and Beyond, The Menil Collection, Houston (2002); Agnes Martin: Paintings and Drawings 1974-1990, organised by the Stedelijk Museum, Amsterdam, with subsequent venues in France and Germany (1991-92); Agnes Martin, organised by Whitney Museum of American Art, New York, travelling to Milwaukee, Miami, Houston and Madrid (1992-94). 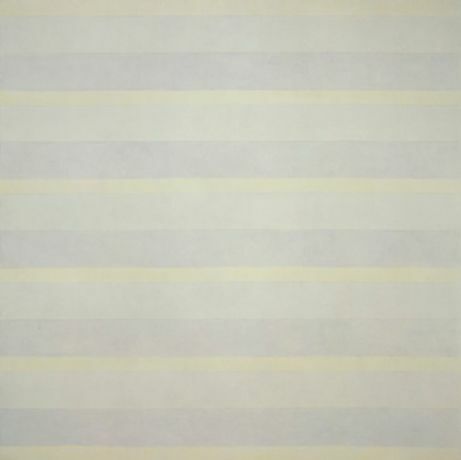 In June 2002 The Harwood Museum of Art at the University of New Mexico, Taos, organised Agnes Martin Paintings from 2001, honouring Martin on the occasion of her 90th birthday. Previous group exhibitions include Documenta, Kassel, Germany (1972), the Venice Biennale (1976, 1980, 1997), and the Whitney Museum of American Art Biennial (1977, 1995). Agnes Martin died in Taos, New Mexico in 2004.